The Château d’Aigle with the Vine and Wine Museum is beautifully located surrounded by vineyards in the Rhone Valley just minutes away from Lake Geneva. 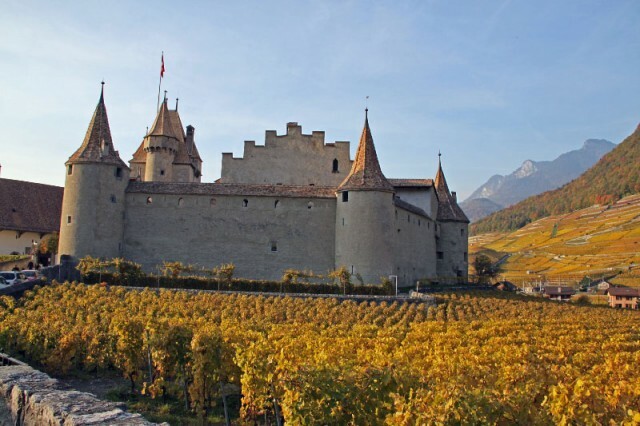 The Château d’Aigle is an historic castle with medieval origins and strong roots in the local wine industry. Visitors may explore many of the nooks and crannies of the fortress including access to the sentries’ wall walk and several towers. The Vine and Wine Museum (Musée de la vigne et du vin) inside Aigle Castle has a collection of historical implements used in the wine-making process but also numerous interactive displays and computer models explaining the making of wine. Château d’Aigle is a great day-trip destination with much to enjoy for families with children of all ages. The views of the vineyards from the castle are absolutely divine. The Château d’Aigle is an historic castle with a beautiful location amongst vineyards at the foot of the Vaud Alps in the Rhone Valley. The castle has medieval roots and absolutely looks the part with thick walls, towers and turrets, curtain walls, and arrow slits. The oldest parts of Aigle Castle date back to the twelfth century but the present structures are mostly from the period of Bernese occupation (1475-1798). The Vaudoises certainly do not nurse a grudge with many Bernese symbols still visible throughout the castle – most prominently the Bernese bears over the main entrance. Since the Bernese left, the Chateau d’Aigle has done service as government buildings, prison, poor house and courts but since 1976 it has been the permanent home of the Musée de la vigne et du vin (Vine and Wine Museum). Visitors to Aigle Castle receive a free guide pamphlet (French / English) which is useful as it is a bit of in and out, up and down, to see all the rooms open to the public. En route, visitors not only see historic and architectural elements but also exhibits related to winemaking and the appreciation of wine. The vine and wine museum includes both historic objects as well as a modern explanation of all elements related to the wine industry. The museum was renovated in 2013 and uses a wealth of computer aided and interactive displays. Visitors can try to blend their own wine digitally and learn how different elements influence the final product. Many of the interactive displays are also entertaining for children. In the rest of the castle, visitors see the usually collection of historical furniture, weaponry, surviving wall and ceiling paintings, art, and the obligatory torture room. Many of the displays are interesting but nothing is of universal importance making it easy to enjoy the castle for the building alone and simply glance at the odd object that catches the eye. Children will enjoy the many staircases, nooks and crannies, and blind alleys. Also enjoyable is a walk along three sides of the castle on the sentries’ wall walk (chemin de ronde). From here, visitors can enjoy views of the castle courtyard but more importantly the lovely vineyards that surround the fortress. Don’t miss the very narrow and steep set of stairs in the western tower going to a former prison cell – from here enjoy the magnificent views unspoiled by dirty glass panes. The access is marked only by a small Cellule sign and not mentioned in the visitor’s pamphlet. Admission tickets to the Aigle Castle are CHF11 for adults and CHF5 for children 6 to 16. The Swiss Museum Pass is accepted. The ticket includes admission to the adjacent Maison de la Dime but this old barn with art gallery may be of limited interest to many visitors. As a medieval castle, the Château d’Aigle is unfortunately not wheelchair accessible at all. Many paved routes pass by the castle and allow easy wheelchair and stroller access to the beautiful panoramic views from the vineyards. Aigle is the first Autoroute exit when driving from Villeneuve and Lake Geneva up the Rhone Valley. (Being on the right bank of the Rhone River, Aigle is in Canton Vaud and not Canton Valais.) The castle is in the far eastern parts of the town – when driving, follow signs to Aigle Est / Leysin and then the brown “Chateau” signboards. Parking at the chateau is very limited and car access problematic making it better to park outside the old town area and enjoy the short walk to the castle entrance. Driving times are around an hour from Geneva Airport and Bern, half an hour from Lausanne, and 15 minutes from Montreux. Aigle is usually a stop on all trains going from Lac Léman up the Rhone Valley. Traveling times on direct trains are around 1:15 from Geneva, 0:30 from Lausanne, 0:10 from Montreux, 0:16 from Martigny, 0:30 from Sion (Sitten), and 1:45 from Bern (change trains in Lausanne). Swiss public transportation timetables and train tickets are available online from Swiss Railways. The castle is an easy just over a kilometer walk from the CFF train station – buses and trains are available to Aigle-Place du Marché stop but this will save only around 5 minutes of walking. However, Place du Marché is a good stop if traveling from Leysin (25 minutes) on the regional mountain train. Hiking and cycling routes, including the wine route, pass by the castle. Many well-paved routes crisscross the vineyards for pleasant walks in most weather conditions. Every season has its appeal but the golden colors of autumn are hard to beat. Chateau de Chillon on an island in Lake Geneva between Villeneuve and Montreux is a pleasant alternative to visiting Chateau d’Aigle. It claims to be Switzerland’s most popular monument and is open year round. Other towns worth seeing in the region include Martigny (Foundation Pierre Gianadda and the St Bernard Dog Museum) and Le Bouveret (Aquaparc and Swiss Vapeur Parc). Photos of Chateau d’Aigle for more photographs and images of the castle and autumn-colored vineyards.